Lymphatic filariasis is common in tropical countries and is endemic in India with most infections caused by Wuchereria bancrofti. The microfilaria are not just confined to the lymphatic system, but also associated with other organs, subcutaneous tissues, and serous cavities like pleura and pericardium. Demonstration of microfilariae (Mf) in the peripheral blood smear or in the tissues is the mainstay of diagnosis. Filariasis acutely presents with fever, adenolymphangitis, funiculitis, epididymitis, orchitis, or pericarditis. Lymphedema, hydrocele, elephantiasis and chyluria, and pleural or pericardial effusion are features of chronic infection. Our case was a rare as recurrent hemorrhagic pericardial effusion and tamponade, which was first treated with diethyl carbamazine and finally albendazole. Successful treatment with ivermectin and albendazole has not been reported in literature. A 30-year-old female with severe breathlessness since 2 days prior to admission. She complained of cough and breathlessness on exertion and low grade fever since 3 weeks and generalized weakness since 1 week. On examination, she was severely dyspneic and had pulsus paradoxus. 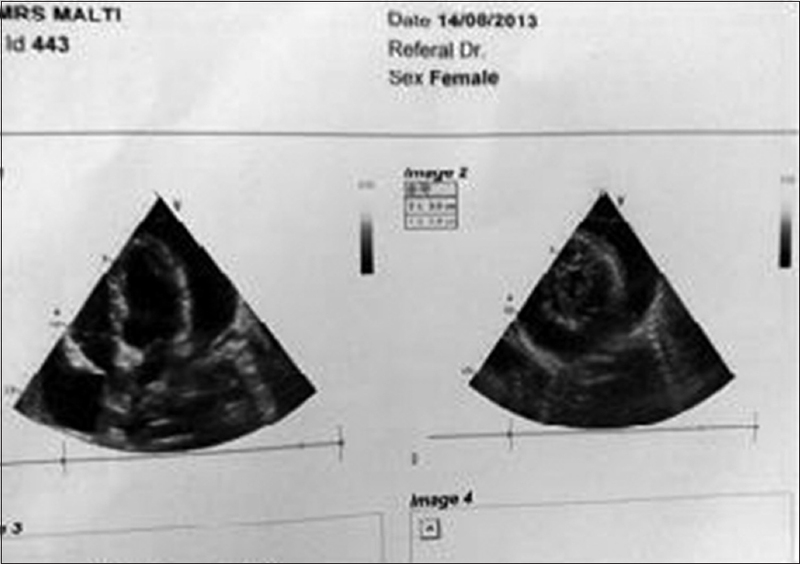 Echocardiogram showed massive pericardial effusion with cardiac tamponade [Figure 1]. Pericardiocentesis was done and 1,300 ml of hemorrhagic fluid was collected. A continuous drain was put. Results of complete blood picture were: Total count - 6,800/mm 3 , polymorphs - 67%, lymphocytes - 23%, eosinophils - 06%, monocytes - 04%, platelet count - 160,000/mm 3 , hemoglobin - 11 g%, erythrocyte sedimentation rate (ESR) - 40 1 h., human immunodeficiency virus (HIV)-nonreactive, and hepatitis B surface antigen (HBsAg)-negative. Complete urine examination, blood sugar, urea, creatinine, and electrolytes; all were in normal range. Cytological analysis of fluid showed - 7,000 cells/mm 3 , (neutrophils - 35%, lymphocytes - 65%, plenty of red blood cells (RBC)), negative for malignant cells, sugar - 61 mg%, proteins - 6 g%, albumin - 2.5 g%, adenosine deaminase (ADA) - 23 U/L, acid-fact bacilli (AFB) - negative; microscopy and routine cultures were negative for bacteria. While screening the smears, a few large, long, smooth-walled, refractile unstained worm-like structures were observed. The organisms were identified as Mf of W. bancrofti in the smears stained by Leishman's stain [Figure 2]. Peripheral blood smears were negative for Mf. Patient was started on diethylcarbamazine (DEC) 100 mg twice daily. The patient improved rapidly and subsequently discharged. DEC was continued for 3 weeks. Six weeks later she presented with similar complain. Cardiac echocardiogram showed massive pericardial effusion with cardiac tamponade. Pericardiocentesis was done and 1,100 mL of hemorrhagic fluid was collected. Cytology showed plenty of RBC, occasional pus cells, and microfilaria of W. bancrofti [Figure 3]. There was no evidence of malignant cells. Hematological and biochemical tests were within normal limits. HIV and HBsAg were nonreactive. Adenosine deaminase (ADA) level was 22 U/L. She was treated with single dose of 12 mg ivermectin and albendazole 400 mg. The patient improved rapidly by next day and effusion was grossly reduced by the 2 nd day. Albendazole was continued for another 2 weeks. The patient is doing well and is on regular follow-up since then. Lymphatic filariasis is a common public health problem of southeast Asia. It is transmitted by the culex mosquito and is caused by two closely related nematodes, W. bancrofti and Brugia malayi, which are responsible for 90 and 10% of the cases, respectively. Microfilaria have been confined not only to the lymphatic system but also associated with other organs, subcutaneous tissues, and serous cavities like pleura and pericardium. Pericardial effusion is a rare manifestation of filariasis, and recurrent effusion with tamponade is even more rare. Our case was of massive pericardial effusion established as filarial in origin on demonstration of Mf in pericardial aspirate. The patient did not have any other evident features of filariasis. Usually chylous serous effusions are well-established manifestations of filariasis. This case had recurrent hemorrhagic effusion which is very unusual for filariasis. The portal of entry of Mf to the pericardial space is still a speculation. It might have lodged itself through blood stream subsequent to development of pericarditis. As Mf are capable of penetrating the tissues of the vector, they can freely move in and out of small, delicate blood, and lymphatic capillaries and tissues of the vertebrate host. Peripheral blood smears may be negative for Mf in cases of secondary manifestations of filariasis. In this case also, peripheral blood smears were negative. Clinical picture did not give any clue. Other etiologies related to recurrent hemorrhagic effusion were ruled out. Patient developed effusion despite being treated with DEC suggests that it may not be 100% effective in all cases as DEC does not act on microfilaria residing in lymphatics, and they might have migrated to pericardial space causing recurrent effusion. She was finally cured with alternate combination of ivermectin and albendazole, which makes it even more interesting. Although Mf in unusual sites are considered incidental findings, on the basis of existing evidences we suggest that some of the cases of recurrent pericardial effusion, especially those from endemic areas, might be of filarial origin. It is therefore emphasized that a thorough examination of the aspirated fluid for Mf is warranted in all patients with unexplained pericardial effusion. Basu A, Sistla SC, Verma SK, Jagdish S. Lymphadenovarix in the axilla - an unusual presentation of filariasis. Filaria J 2006;5:9. Prasanthi K, Nagamani K, Saxena NK. 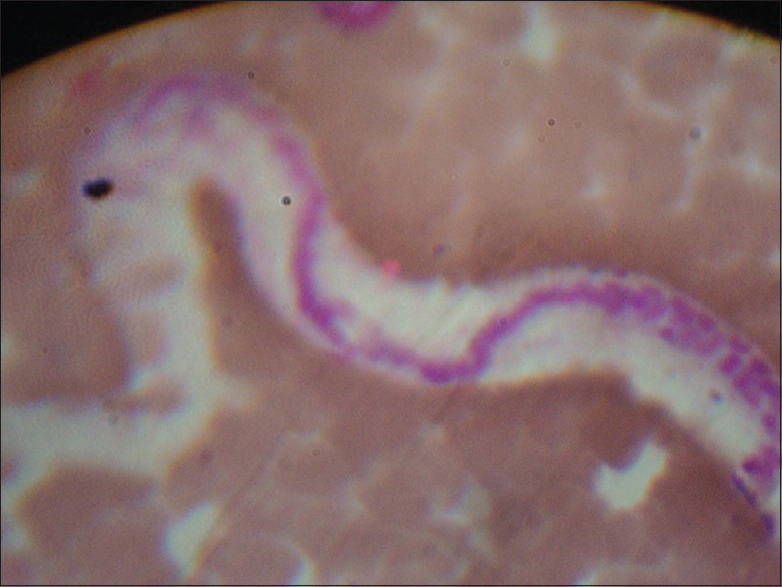 Unresolving pericarditis: Suspect filariasis in the tropics. Indian J Med Microbiol 2010;28:73-5. Patil PL, Salkar HR, Ghodeswar SS, Gawande JP. 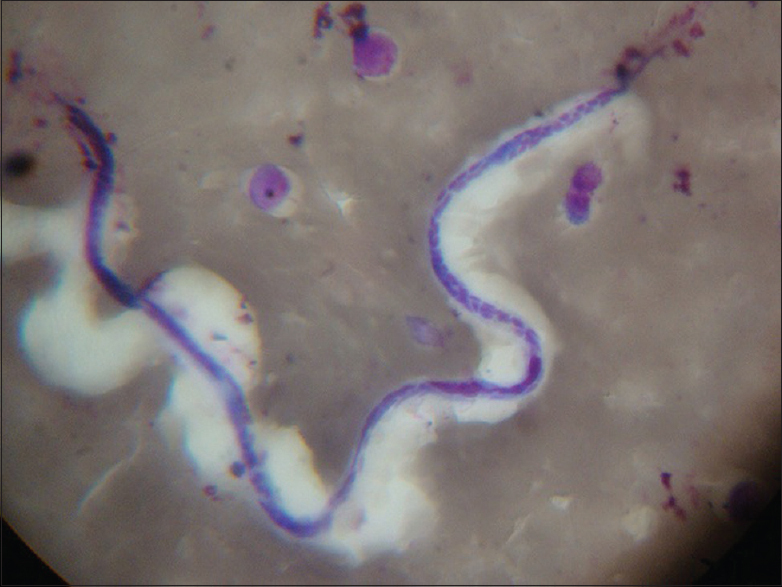 Parasites (Filaria and Strongyloides) in malignant pleural effusion. Indian J Med Sci 2005;59:455-6. Chowdhary M, Langer S, Aggarwal M, Agarwal C. Microfilaria in thyroid gland nodule. Indian J Pathol Microbiol 2008;51:94-6. Reddy GS, Balasundaram S. Filarial pericardial effusion. J Indian Med Assoc 1977;68:125-6.